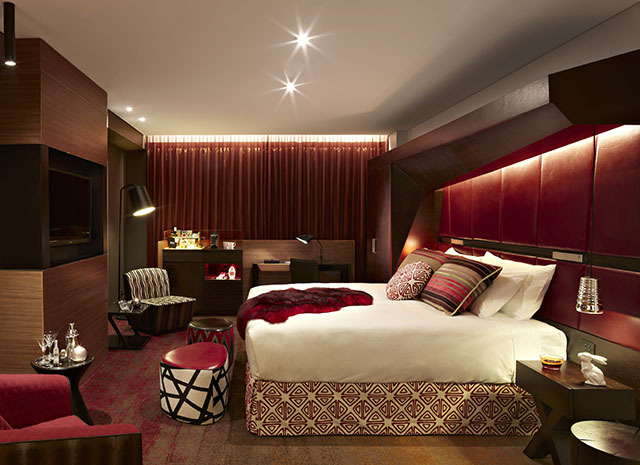 QT Hotels and Resorts are a grouping of some of Australia’s most dynamic design hotels. The creation of QT Sydney encompassed the total transformation of two landmark buildings in the heart of Sydney. The design and sophistication of the 200-room deluxe hotel was an ambitious melding of the former Gothic, Palazzo-style Gowings department store and the adjacent Art Déco State Theatre — both opened in 1929. Converting these classic buildings into the hippest and most luxurious of hotels – all the while respecting and retaining their landmark status, was an extraordinary and challenging process, involving some of Australia’s most creative architects, designers and taste-makers. QT Melbourne – dating from the fall of 2016 – is the latest addition to the luxury hotel scene in Australia’s second city, with 180 rooms. As in Sydney, its bar and restaurant are expected soon to become the center of the city’s hippest scene. Additional QT Hotels and Resorts include the QT Bondi, on Sydney’s iconic Bondi Beach; QT Canberra in Australia’s capital; the QT Gold Coast in Queensland; and the QT Port Douglas adjacent to the Great Barrier Reef. Soon to open is the first QT in New Zealand, the QT Museum Wellington.